With much pain I share with you these few heartfelt words from my cousin Rabbi Oshy Deren who just lost his sister a few short hours ago. Boruch Dayan Ha’emet - Blessed is the True Judge. 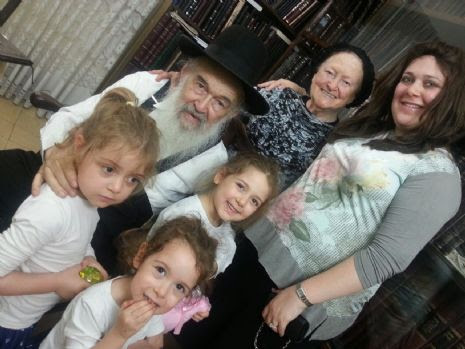 It is with profound sadness and shock that we share the unbearable news of our beloved sister Rivky Berman (nee Deren), a warrior of Hashem to perfect the world, completing her mission here on earth just a few hours ago and returning her soul to the paradise of heaven, whose glow and light she reflected here for the last 29 years. In a lifetime that some would describe as pain and illness, Rivky fought back to live a life of joy, celebration, adventure, ambition, fashion, and more than anything - purpose. She was a devoted Shlucha, ambassador of the Rebbe both in her hometown of Stamford with my parents, and, when divine providence led her there, in the vincinity of the Duke University Medical Centre in North Carolina, where she served together with the person whose presence literally gave her another five years of life - our beloved Shmulie. Using her life challenging chronic lung condition, double lung transplant, and understated bout of (beating) cancer - as platforms to help others, Rivky’s smile, determination and fierce independence set a new standard of living, for all of us. http://rivkyderen.tumblr.com. In her final moments this morning, Rivky was surrounded by her treasured life partner - our beloved brother in law Rabbi Shmulie whose care, patience, and lifeline of inspiration for Rivky will forever be truly appreciated by Rivky and Hashem alone; my beloved heroic parents who with superhuman stamina, faith that would shame the angels, and a parenting love, skill, sensitivity and leadership of biblical proportions, devoted their life to her physical, spiritual and emotional welfare for the last thirty years; her dear parents in law who loved her and welcomed her in to their life like the daughter they never had; my precious sister Chanie who was and is a true soul sister (to all of us) that held the hand of her little baby sister from infancy and through all of the many raging rivers that crossed their path thereafter (and was at Rivky today together with her baby Yitzchak Zalman representing all of her nieces and nephews whom she loved as the children that she and Shmulie never had); and my older brother Yossi whose steady presence as the senior anchor of us siblings radiates a calming peace that she had with her as she began her first step upwards to her place of the peace and rest that eluded her for so long. Zeesy and I are currently enroute (with deep gratitude to Bubbeh Rochel who is at our home with the children) to the USA and my brother Chezi from Melbourne will be joining us there as well. And our three other siblings, Mendel, Blumi and Shloimy are surely preparing the royal welcome that awaits this brave and courageous soul at the gates of heaven today. 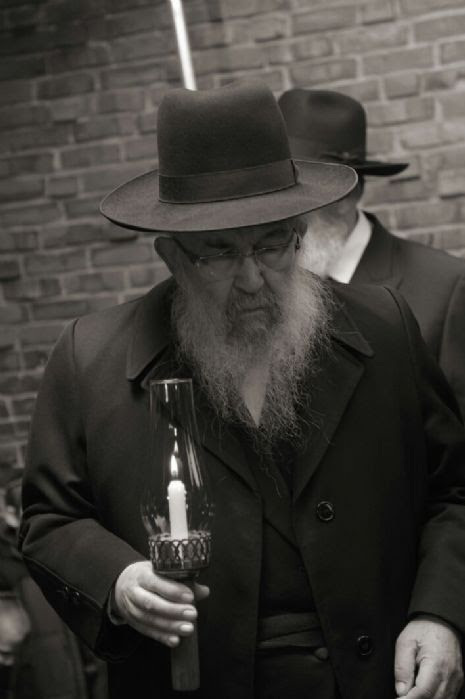 The funeral procession will be passing by Lubavitch World Headquartes at 770 Eastern Parkway, Brooklyn, tomorrow, Tuesday morning and we will be sitting Shiva at our parents home in Stamford, CT. In due course we will pay tribute to Rivky in Cape Town for all of you, our dear Cape Town family to hear and share more of this beautiful life for whom you prayed and cared for so lovingly. The signature of Rivky’s email (and closing line of her Matric Valedictory Speech) was ‘in the end it will all be good, and if it’s not good, it’s not the end.’ Today is not the end of Rivky’s life. We hope and pray that before very long our entire family will be reunited when Hashem will ‘wipe away the tears from off all faces’ and we will celebrate our ‘end’ in a world of eternal health and peace, with the coming of Moshiach. If there’s anything that Rivky wants from all of us now, it’s to take on that one more Mitzvah, to tip the scales, and bring us all together again. 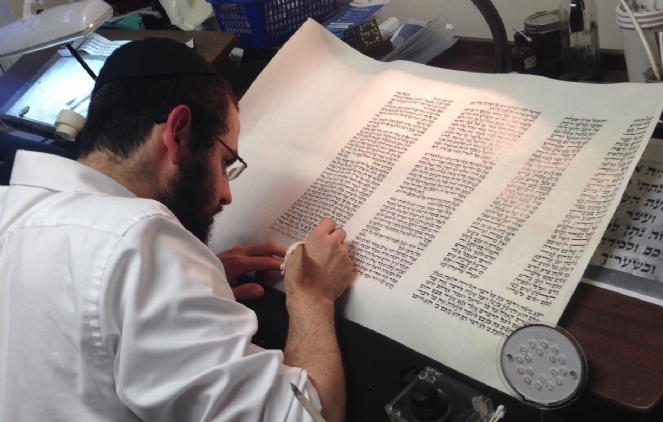 We are overjoyed that a Torah Scroll is now being written in Israel; the very first being written for The Chabad Maple Shul. Shimon Ben Mordechai and Rivkah Bat Carrol welcome you to participate in this tremendous Mitzvah by dedicating a portion of this new Torah Scroll. Dedications can be made in memory of loved ones or in honor of friends and family members. Go to www.chabadmaple.com today to make a dedication. What better way to celebrate this Hakhel year, A year of Jewish Unity, than by dedicating our very first community Torah Scroll! Torah is the most precious article in Jewish life. Its contents are perfectly intact—the exact same words that we received together as a people some 3,300 years ago-transcribed by Moses from G-d Himself. The original scroll was kept in the Holy Ark, and an additional scroll was gifted to each of the twelve tribes. From these original scrolls, additional Torahs were transcribed in precise detail, generation after generation, in an unbroken chain to Sinai. Despite years of upheaval and suffering, not one of the Torah’s 304,805 letters has been lost or changed; the words we read in the synagogue today are the exact words recorded by Moses. The final Mitzvah in the Torah is for everyone to write a Torah Scroll. By dedicating a letter, word, or verse for yourself, your children, family members or friends, it is as if you have written your own Torah Scroll. In addition, this Mitzvah brings G-d’s blessings to your family, in your home and business. In our tradition, no letter is more important than another. Just as every letter in the Torah is indispensable—if even one letter is missing the Torah is invalid—so is every member of the Jewish people essential to our wholeness as a nation. Hence, by participating in the creation of this Torah, you will not only have a lifelong remembrance, but in a very special way you are signifying that you are one with the Jewish nation, one with tradition, one with our destiny. As our community Torah scroll nears completion -G-d willing in September 2016- we will have a joyful ceremony to complete the final letters and to welcome the new sacred addition to our community. Each person who participates by making a dedication will be honored with writing a letter at this special ceremony. We welcome your participation in this special Mitzvah. 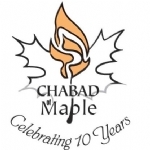 Please visit www.chabadmaple.com to make a dedication today. All contributions made to Chabad of Maple are Tax Deductible. Vaughan, ON (December 27, 2015) — Based in Maple, Ontario, Chabad of Maple will be hosting a very exciting year-end fundraising campaign—“If Not Now, When?” which will kick off this Monday December 28th at noon EST, and will continue for only 36 hours until Tuesday December 29th at midnight, EST. "Tzedakah (charity) is equal to all the other commandments combined." This meaningful fundraising campaign will provide community members with 36 hours of tremendous opportunity to support the influential and far-reaching work that Chabad of Maple provides to the community at large. As Hillel quoted above, “If not now, when?” Now is the time for the Jewish community to unite efforts to strengthen our local community, to build a bright future and to preserve meaningful traditions. There has never been a better time than “now” to support the efforts of local Chabad leaders. During this campaign, for every $1 that is donated, Chabad of Maple will receive an additional $2, therefore, all donations will effectively triple in value. Essentially, your $100 charitable donation will be tripled and will translate into $300 for Chabad of Maple! Of course, no donation is too small and each one, appreciated. The goal of Chabad of Maple is to raise $21,000 in the campaign’s 36 hours to help close the gap in their 2015 budget and start 2016 on the right foot. Funds raised will help the shul continue their tireless dedication and work in the community, including to their rich Hebrew school program—Chabad Maple Aleph Champ Hebrew School which takes place on Tuesdays at the Lebovic Jewish Community Centre (maplehebrewschool.com), interactive classes for all ages, exciting Holiday parties, fun and engaging children’s programs, inspiring Shabbat services and Chesed (kindness) projects, such as Kids for Kindness (www.kidsforkindness.ca). 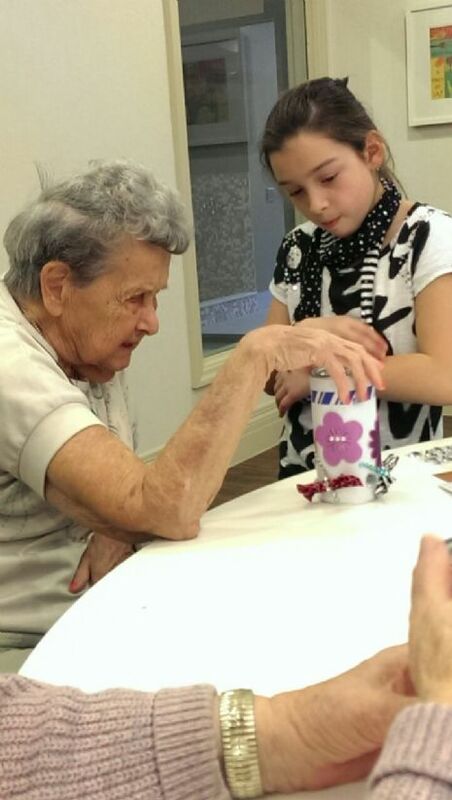 Kids for Kindness is a unique program developed by Chabad of Maple, which brings children together with seniors in weekly group activities like crafts, baking and games. Seniors can share their experience and stories with children who then can develop a lifelong love of volunteering. 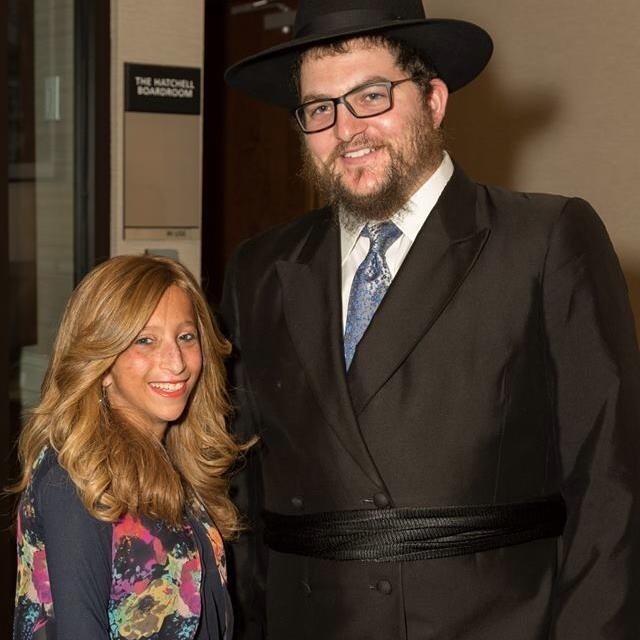 Chabad of Maple Shul is led by Rabbi Chezky and Shaina Deren. The congregation maintains the goal of serving the entire family, including every single member of the larger Jewish Family. The shul’s mission is to promote, teach and advance the teachings of the Jewish faith as illuminated by the teachings of Chabad Chassidut, primarily the underlying principles of love, kindness and compassion for others. It is their mission to address the individual needs of every member of the community physically, emotionally and spiritually through love and compassion. They pay particular attention to their children, seniors and those who are vulnerable and in need of kindness. For more information about Chabad of Maple’s “If Not Now, When?” year-end fundraising campaign and to learn about how you can make a difference, visit www.chabadmaple.com/match after noon on Monday December 28 but before midnight on Tuesday! Lisa Cantkier, BA, BEd, CHN, is a holistic nutritionist, writer and editor based in the Greater Toronto Area. Thank YOU. With your help we did it! Shaina and I are so touched that the Year end Match-A-Thon once again exceeded our goal and raised $16,881 in just 48 hours! We're tremendously humbled by the outpouring of support. To us, this means Chabad of Maple is needed and appreciated more than ever before. We promise to continue to do everything in our ability to strengthen, connect and uplift every Jew in our community. We will strengthen the new weekly Shabbat Service at the Chabad Maple Shul. We will expand the Chabad Maple Hebrew School and ensure every child in our commity has the opportunity to study, experience, and appreciate our rich heritage and gorgeous traditions. At Kids for Kindness children will increase acts of Chesed and bring happiness and laughter to isolated seniors living in our very own community. If you didn't yet have a chance to give, it's not too late! Your support today will allow us to begin 2015 with a bang! Less worries about paying the bills and even more focus on igniting Jewish souls. Two simple and easy ways you can help is by joining the Chai Club by making a modest monthly credit card contribution for 12 months. Even easier; send me an email and get your Chabad Maple Tzedaka Pushka (can) for our home and office. Deposit a few coins each weekday and before lighting the Shabbat Candles. You will be surprised what a daily Mitzvah of giving can do; and what a difference your pocket change can make! And Thank You to to the 51 individuals! who contributed towards this tremendous campaign. It all started less than two weeks ago. One hour after Shabbat (still on a high from Strings of Triumph a few days earlier) we piled all the kids into the van and headed to Pittsburgh for my baby sister Bracha's Bat Mitzvah. Some of you may have met Bracha when she was here for Yom Kippur. Bracha means blessing and Bracha is truly the greatest blessing and gift our family has ever recieved. 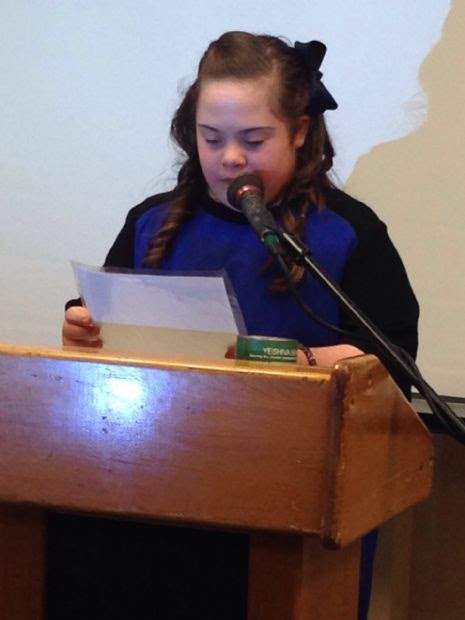 Bracha was born twelve years ago with Downs Syndrome. With a tremendous amount of hard work with my amazing parents and 12 loving siblings (yes, I am blessed with 9 sisters and 3 brothers) Bracha is Thank G-d very high functioning. She truly exemplifies pure love, joy, and hard work. She can do anything any other child can do with just 100 times the amount of work...most children naturally learn to walk and talk she had to go through intense therapy. It is a real inspiration to see how she works so hard. And now it was Bracha's Bat Mitzvah. She spent weeks preparing her Bat Mitzvah Speech. You can only imagine how excited she was for this day. About a half hour after we left our house as we are getting onto the QEW we get a message. Sabba passed away. Shock...pain...disbelief...guilt (why didn't I speak to my Sabba more often??). Sabba, Rabbi Yaacov Dov Katz OBM, my mothers father was born in Poland. He was a young boy when the nazis invaded. Miraculously they were shipped off to Russia, where they spent the war years in Siberia. At my Bar Mitzvah Sabba told us how at 9 years old he would go with his brother out in middle of the night to chop wood for his family. It was -50C, if he would take off his gloves for a second; His hands would freeze. He described how with a small candle burning on Shabbat, his father, his brother, and himself would huddle around the one volume of talmud they had grabbed from the table as they were forced to leave Poland. It was the only Jewish book they studied for five years. Decades later he still knew every word of that book by heart. After the war Sabba made it to Israel where he educated and influenced thousands of students during the over 47 years that he served as mashgiach and later as Rosh Yeshiva of Tomchei Temimim in Kfar Chabad, -The central and largest Chabad Yeshiva in Israel- which produced Chassidim, Rabbis, Shluchim and community leaders living around the world. 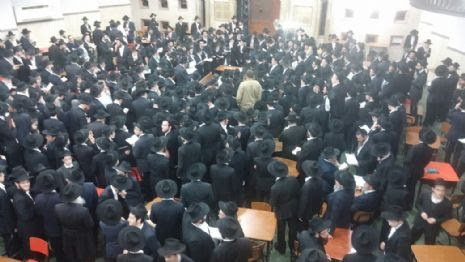 Thousands of his precious students from all across Israel came to his funeral. Just two years ago Sabba and Savta were here for my brothers wedding. My Sister from Rome visiting Sabba and Savta in Israel a few months ago. 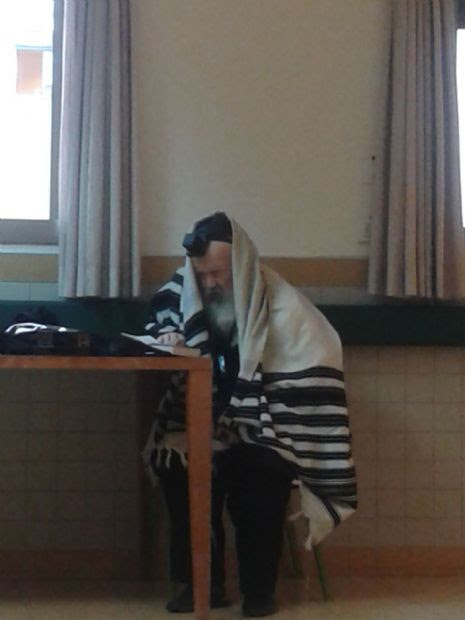 One of the last pictures of Sabba praying in the Hospital a couple of days before he passed away. Now getting back to Brachas Bat Mitzvah. My mothers strength and faith in Hashem is unbelievable. Right after she heard the devastating news of her fathers death; her first response was that Brachas Bat Mitzvah should go on as planned, despite the fact that she will not be there. My mother got onto a flight the next morning to Israel and we continued to prepare for Brachas grand Bat Mitzvah. Bracha had been waiting for this day for months...Only with the guidance of Torah and pure faith in Hashem can I describe the intense emotions felt. Brachas face was shining. She read her speech beautifully. She read her new chapter of Tehillim in Hebrew flawlesly. 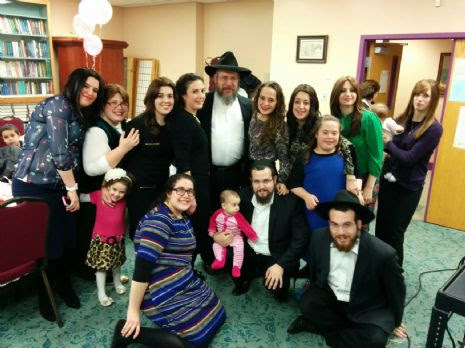 Some of us (not the whole family ;)) posing for a picture with Bracha. Now heres where things got really crazy...in a good way. My mother got up from Shiva Sunday morning. On Sunday night my parents got onto a flight and arrived back in NY early Monday morning. They went straight to the Lubavitcher Rebbes Ohel - Holy resting place where they went with my sister to ask for the Rebbes Blessings and announced her engagement to Levi Harlig from Las Vegas. (No they are not in the Casino Biz; His parents run Chabad, Yes Chabad in Vegas). A few hours later my sister Bluma Greenwald gave birth to her first baby girl who was just named yesterday after my grandmother Kenya Deren. Thank You G-d for blessing us with such a beautiful family. Thank you for giving us the Torah that guides us through the happiest and the darkest events in our lives. Thank you for giving us our Sabba who has taught us so much and left us with so much still to learn.